Acknowledgement: Grace Evans, Euroa Gazette 28th November 2018 Edition. 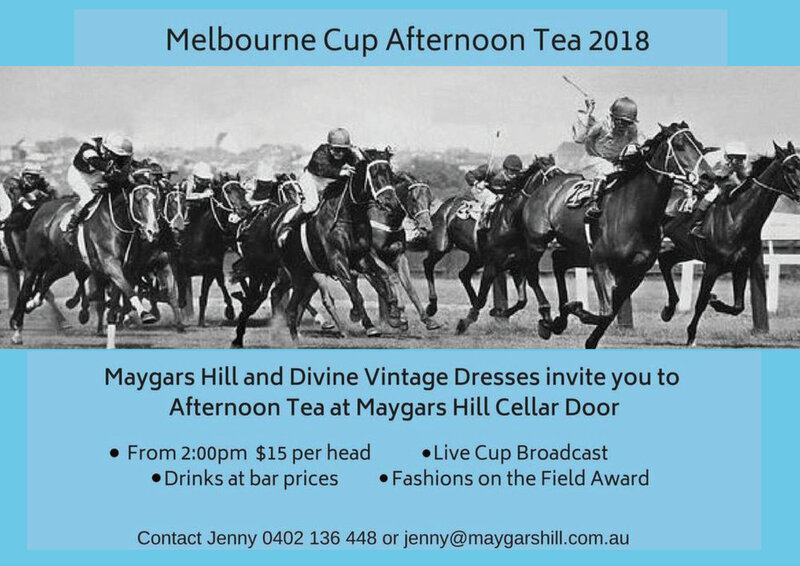 Join us at Maygars Cellar Door with dressmaker from Longwood, Karen Mizzi, for a discussion about her passion for restoring and recreating vintage fashion. Included in the discussion will be selected garments and accessories from last centuries most glamorous eras. With guest appearances from Australian Fashion Historian Tom McEvoy & Artist Bec Threlfall. Afternoon tea optional at $12 per head, however bookings essential. It’s on again 8th - 11th June 2018 - Divine Vintage Dresses bigger and better! Last year was such a success we're doing it again. This year we've added live music to sooth the Friday soul. Friday night the 8th of June Preview - 5:30pm $10 per head, drinks at bar prices. Bookings preferred please. Saturday at 11.00 am - Complimentary sparkling and nibbles with the exhibition opening. Steph Ryan, Member for Euroa will lead the way, dressed in vintage by Miss Mizzi! Exhibition continues Sunday and Monday 10.30am - 4:00pm. Would you like to join our wine club? Wine Club members receive copies of our newsletter, information on our pre-release vintages, discounts on Maygar's Cottage and other offers as they become available. Click here to join our mailing list. We look forward to welcoming you to our wine club!